85ft Horizon Angeleyes is the ultimate charter yacht, coupling an exceptional crew with a modern yacht offering more volume than many 100 footers for up to 10 guests in 5 cabins. Angeleyes is the perfect choice for groups looking to experience the most fun and luxury possible on a Caribbean charter. Angeleyes is an stunning example of the Horizon FD85’s design concept: to take advantage of the voluminous 24ft beam and provide areas, both indoors and out, for charter guests to enjoy the ultimate yacht for entertaining and relaxing. Angeleyes’ main salon incorporates huge floor-to-ceiling glass windows, allowing guests to enjoy the ever changing island view. The interior dining table can seat 8 and can be used for more formal dining, with another large dining table on the aft deck for 10 when guests prefer to dine alfresco. The yacht’s interior is modern yet comfortable, mixing elegant Wenge and Sycamore woods with neutral soft goods, furniture and upholstery upgrades. 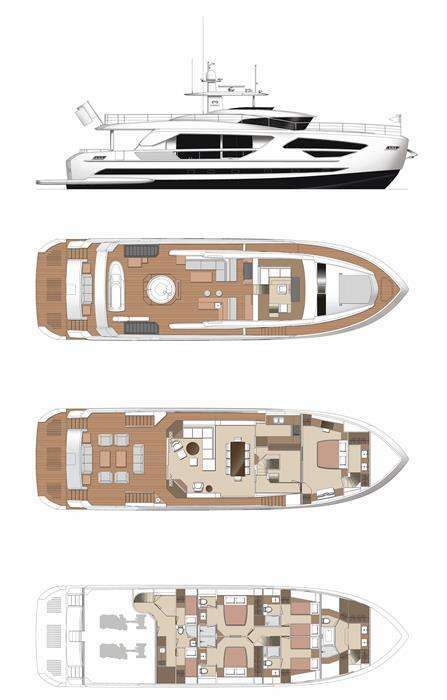 With a huge 24ft beam Angeleyes offers a cabin layout and volume unmatched by similar sized motor yachts. She offers 5 double, en-suite cabins, making her the perfect choice for a group of 5 couples. Angeleyes offers an on-deck master suite with a huge master bath complete with rain shower and jacuzzi tub. Below deck are 2 walk around VIP suites with Queen beds and 2 staterooms with 2 twin beds that both have the option to convert to King beds if preferred. The yacht’s spacious aft deck and open flybridge invite quality time spent with family and friends. The flybridge is the perfect space for guests to all relax together, with multiple seating area, a large hot tub, full wet bar and pop up outdoor TV that can swivel 360 degrees to enjoy at any angle. Angeleyes comes equipped with a brand new, state-of-the-art Novurania 24ft tender with 200hp outboard. This tender in uniquely fitted with a drop down bow step, which means the tender can be driven right onto the beach and guests can step directly from the RIB onto the sandy shore without ever getting wet! Angeleyes has a crew of four. Captain Darrel grew up in Johannesburg where he spent his time prowling the suburban jungles and raising his pet lion, Chaos. He holds degrees in actuarial science, accounting and company law, as well as being a lieutenant in the South African National Defense Force. In 2003 he decided to go to sea. He moved to Cape Town to upgrade his sailing qualifications. After several months of sailing some of the roughest waters on the planet, he finished his qualifications, and holds a commercially-endorsed Royal Yachting Association Yachtmaster Ocean Skipper's ticket. He has lived and sailed in the Caribbean for the past eight years, sailing on a variety of vessels in the charter industry. He has extensive sailing experience throughout the Caribbean and knows where to find the best bars on most islands; essential knowledge for a charter-boat captain. Chef Jenn grew up in Canada but has strong family ties in the islands. She visited the British Virgin Islands for the twenty years and took the leap four years ago to move and become a local. This has worked out well, as she brings her considerable experience and skill in the hospitality and food industry on board. She has had a fabulous year on a Horizon 60 and the guests continue to rave about her gourmet cuisine and out-standing people skills. Jenn comes from a family of chefs and has worked in the hospitality industry for many years. Her experience comes from formal training and hands-on learning. In addition to her delicious culinary creations, she also boasts some mean mixologist skills, and there is an ongoing contest on board as to who mixes the best drinks. Thus far, Jenn’s Mai Thai leads the polls, with Darrel’s margarita a close second. Either way, the guests win. Jenn is a versatile chef who works closely with guests to come up with a charter menu tailored to their personal preferences. She enjoys using locally-grown foodstuffs and tries to incorporate a farm-to-table approach in her cooking. She has amazing contacts and local suppliers down here that assist in this, and she strives to incorporate healthy and wholesome nutrition in her delicious meals. Her favorite culinary creations are classics with a twist. Her menu planning skills are second to none and she will make sure everyone is satisfied at mealtime. A keen surfer and beach bum, Jenn’s love of the water and the island life are a perfect fit for the charter lifestyle. Combine that, with her warm and caring nature, and it makes her everyone’s favorite crew member. She is a warm, genuine, friendly soul, and we are very happy to have her on board as part of our team. Contact us for rates and current availability or to book a charter aboard Angeleyes!